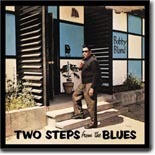 Two Steps From The Blues is almost unanimously acclaimed as the ultimate Bobby “Blue” Bland album. It was released during a time (1961) when Bland was at the height of his popularity and talent and captured several of his recent singles for Duke/Peacock Records into one collection. Though Bland had been recording raw, urgent blues since the early ’50s, in the time period spanning the late ’50s into the early ’60s, producer Joe Scott was able to combine the best aspects of blues, soul, and gospel music at the time into Bland’s recordings. The scorching guitar solos by guitarists like Roy Gaines and Matt “Guitar” Murphy had been replaced by layers of horns, jazzier guitar from Clarence Hollimon and Wayne Bennett, and the occasional string arrangement. Bland’s amazing vocal gifts, a voice which allowed him to easily move from pleading to angry to pensive, allowed him to fit perfectly into any format they tried and for several years, the results were magical. The song selection on Two Steps From The Blues is familiar to any blues fans. The title track is arguably one of the best soul/blues songs ever written and several of the selections (“Cry Cry Cry,” “I’m Not Ashamed,” “I Don’t Want No Woman,” “I Pity The Fool”) that follow could also compete for that title as well. A lot of these tracks and others (“Lead Me On,” “Don’t Cry No More,”) have been covered repeatedly over the years by other soul/blues artists, but it’s hard to match the original interpretations by Bland. One little-known fact over the years has been the attribution of composer credit for some of these songs to one Deadric Malone. In fact, Malone was a pseudonym used by Duke/Peacock Records chief Don Robey to garner composer credits for songs written by others, who usually only received a one-time payment for their song and none of the royalties, which went to Robey. Using this scheme, composers like Texas Johnny Brown, who wrote “Two Steps From The Blues,” and Joe Medwick, who wrote “I Pity The Fool,” “I Don’t Want No Woman,” and “Cry Cry Cry” (in addition to Junior Parker’s standard “Driving Wheel,” and “Further On Up The Road”) were gypped out of thousands of dollars of royalties over the years. Granted, most of these composers were more than happy to get money “in hand” during that time to help pay the bills, but the truth is that they probably either didn’t know about or weren’t properly advised about the concept of songwriting royalties. Two Steps From The Blues was reissued by MCA several years ago with two “bonus” tracks, neither of which add to nor diminish from the original album. That being said, why in the name of George Lucas would MCA want to even tamper with a masterpiece? Bland continues to tour and still records for Malaco Records, where he has released several noteworthy albums since the mid ’80s. He recently turned 75 and, though his voice has suffered somewhat due to the ravages of time, he’s still a impressive performer who puts on a great show. A lot of these tracks appear on countless Bobby Bland compilations (all of which are worth having on their own merits), but their presence on Two Steps From The Blues make it one of the greatest soul/blues albums of all time by one of the premier blues vocalists of all time.